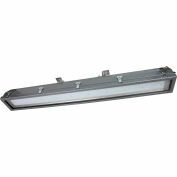 Class 1, Division 2 Chemical Resistant Incandescent Light - 100 Watts - Non-Metallic (-120 Volts-Ceiling). Made in the USA The HAL-CRNM-100W Class 1, Division 2 Chemical Resistant Incandescent Light from Larson Electronics is UL rated Class 1 Division 2, and designed with a non-metal housing for resistance to chemicals and corrosion. This waterproof fluorescent bulb equipped light is pendant, ceiling, or wall mounted, and available in 120-240 VAC voltage configurations. The powerful and durable HAL-CRNM-100W explosion proof light from Larson Electronics is ideal for industrial applications, hazardous work spaces, and areas where gases and vapors may be present and a reliable and durable general purpose incandescent light solution is needed. The lamp housing is waterproof, constructed of corrosion and chemical resistant GE Lexan polycarbonate with Pyrex globe, USCG accepted, and NEMA 4X compliant and suitable for hose-down areas. This unit is fitted with a 100 watt incandescent lamp for long life, efficiency, and cool operation and is available in 120-220- 240 VAC and 12/24 VDC configurations for operation with standard and low voltages. 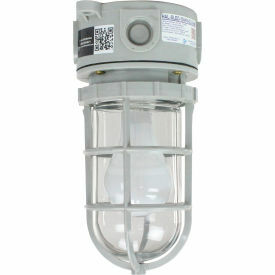 This hazardous area light carries a T2D temperature rating and has a -29C to 40C (-29F to 104F) operating temp range. The HAL-CRNM-100W carries UL 1570/1571 and UL 595 compliance and is waterproof and suitable for spray down areas and marine locations. Wiring is through 3/4" NPT hubs. This light carries UL and CSA certification, UACG acceptance, UL 1570/1571 approval for wet locations in any orientation, UL595 approval for marine environments, and NEMA 4X compliance for hose down areas. The 100 watt incandescent lamp in this unit offers high output, and is protected by a Pyrex globe and polycarboate globe guard. We also offer this fixture fitted with compact fluorescent and LED bulbs for higher efficiency and longer life than incandescent bulbs.